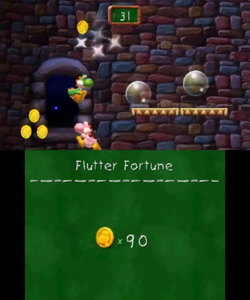 Flutter Fortune is a two-player minigame in Yoshi's New Island. The objective of the minigame is to flutter jump to collect as many coins as possible in one minute. A Yoshi starts the minigame in a castle-like area with coins positioned at various intervals. Bubbles are also positioned at various intervals so that the player can boost the Yoshi's height, and the player who gets the most points at the end is the winner, with each coin being doubled to get the total score. This page was last edited on May 28, 2018, at 10:15.